With insight and honesty, Darrin and Amie Patrick offer much food for thought for men who want their “marriage to thrive, not simply survive.” Their wisdom is garnished from their own committed pursuit to live marriage well, in addition to Darrin’s ministry as an evangelical pastor of The Journey, where they counsel other married couples. 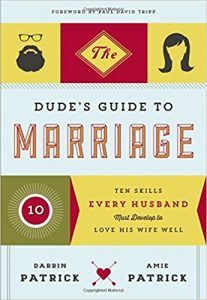 The Dude’s Guide To Marriage: Ten Skills Every Husband Must Develop To Love His Wife Well would be a valuable resource for a single man preparing for marriage, a man who has been married for decades, or any man in between. The book provides a myriad of concrete and practical actions to take, with an authentic glance into the dynamics of married life. While most of the book is written by Darrin, each chapter includes a short section composed by his wife. It is clear that Darrin’s writing has been aided by his wife’s feminine perspective, and Amie’s writing is enhanced by knowing Darrin so intimately. This offers men a valuable opportunity to grow in understanding their wives. Darrin is humble and transparent for the sake of helping men grow in self-knowledge, which is so essential in the intimate union of marriage. He references his natural strengths and admits his own shortcomings and brokenness, part of which comes from not having a father who really taught him how to be a good husband. In this book he seeks to give the mentoring that he never received, which is such a precious gift in our cultural setting of widespread fatherlessness (whether physically or emotionally absent). In doing so, Darrin offers men hope and invites them alongside his own imperfect journey of growing as a husband. A theme that consistently surfaces in the book is the psychological dimension of our lives, as well as the value of professional counseling. Darrin avoids “machoism” and points out the need to be emotionally healthy, which in turn helps a man connect with his wife’s heart. At the end of each chapter, there are suggested questions for spouses to discuss – an invaluable tool to grow in knowledge of self as well as how to love one’s wife. The book is comprised of ten simple chapters: listen, talk, fight, grow, provide, rest, serve, submit, pursue, and worship. It is worth pointing out some of the highlights. Regarding communication, men need not only to hear the words their wives speak, but actively listen well to the heart in their words. On the flipside, men also need to be vulnerable by talking to their wives, so that she can be a part of what is going on in her husband’s life. Darrin coaches men on how to fight well, since “fights” are inevitable when sharing life with your spouse. In particular, he covers how one’s family of origin and personality type shape the way a person approaches conflict. The Dude’s Guide to Marriage also examines the tension between work and rest. A wife needs a husband to develop his gifts well to provide for the family, and to avoid both laziness and workaholism. However, she also needs a rested husband. This is one of the many areas where Darrin references current statistics and cultural examples. Where long hours at work, hurry, and overstimulation have become the norm, we need to humbly accept our creaturely limitations. One way to do this is by returning to the biblical wisdom of resting on the Sabbath. Darrin points out that this is not laziness or mindlessness, but rather a disciplined choice to rest and take delight in the world. And it allows time for a husband to grow intellectually, socially, emotionally and spiritually. Contrary to images we have of men coming home to be served by their wife, Darrin challenges men to serve their wives by giving specific suggestions, including Gary Chapman’s “five love languages” (covered more extensively in one of the appendices). He extends another challenge for men from Ephesians 5:21: “Submit to one another out of reverence for Christ.” Darrin clarifies that men and women have equal value before God, while they also have differing roles. He recognizes the man’s responsibility to lead, but does not try to spell out exactly what that means. Rather he goes in the direction of husband and wife submitting to each other’s personal strengths. Included is a list of guiding principles for a man to discern when he should submit to his wife. The chapter on pursuing one’s wife is written by Amie, in order to give men a real insight into why this does not end on the wedding day: “A woman’s desire to be rightly and intentionally pursued by a man reflects her deep longing to be known, loved and enjoyed.” She includes invaluable, concrete suggestions to help men prioritize this. While The Dude’s Guide to Marriage provides many helpful insights and suggestions, it could be deepened, improved and shored up with a Catholic understanding of the human person, Ephesians 5, and the sacramentality of marriage. Darrin does point out that Christ is the perfect model for a husband, yet he fails to draw out the great news that Jesus’s grace is actually at work in the marriage of two baptized Christians. Also, while he rightfully includes common weaknesses of men, he seems to make the mistake of going in the opposite extreme, by failing to encourage growth in virtue in a way that is particularly masculine. The book does not seem to recognize how masculinity in itself is a gift to one’s wife. The authors provide a wealth of wisdom from their own personal experience of Christian marriage. However, Catholic readers should be aware that it lacks a sufficient understanding of the fullness of the Sacrament of Marriage. Regardless, Darrin and Amie’s passionate commitment to having a thriving Christian marriage is a great witness and has given them much insight to offer any man. Brad Macke lives with his wife and two daughters in Indiana, where he teaches high school religion and serves as the campus minister. He received his Master’s degree in Theological Studies with a specialization in marriage and family from the Pontifical John Paul II Institute in Washington, D.C. Check out this inspiring movie about the importance of fathers.